Before my mother became ill with Alzheimer’s, my husband and I lived in Houston, TX. I rode horses and worked as the executive editor of a community newspaper, and later as the managing editor for a daily newspaper. I was also a contributing editor for Horseman Magazine. Joel and I moved back to my home state of North Carolina so we could be closer to my parents. We built a barn for my horse Crimson, and we were hoping to start a family. That was when I had my first miscarriage and my mother started showing signs of Alzheimer’s. For over a decade I helped care for my mother as I watched the dream of becoming a parent slowly slip away. I journaled through these difficult days, looking for a thread of hope to hold onto. Often, I would walk down to the barn and lean my head against my horse’s strong neck. Crimson would stand like a statue absorbing my grief. Motherhood: Lost and Found grew out of this period of hardship. When it seemed that my life had turned to ashes, writing helped me rediscover the beauty in each day. I’ve always been inspired by personal stories and beautiful language. It’s my sincere desire that my memoir will be an emotional road map for those who are seeking comfort and hope in the midst of loss. 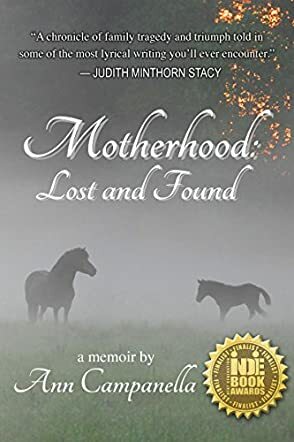 Motherhood: Lost and Found by Ann Campanella is an autobiography tracing the story of her life after she married, through several miscarriages, the family dynamics of her parents aging, most specifically her mother’s slow and painful decline with Alzheimer's disease. Her love of horses is a constant thread in the book and we have flashbacks to her earlier life, moving from place to place since her father was a colonel in the United States army. Living quite a distance from her parents, other members of the family, and their annual vacation to the ancestral home, requires travelling long distances, but not as many as Joel, her husband, makes as he flies around the world, building his own very successful company. This was not an easy book to read, although I found it difficult to put down, and the last third saw me totally engrossed, ignoring the rest of the world as I simply had to finish it and find out what happens at the end. On every page of Motherhood I could feel her frustration and anguish. She is torn between her life with her husband, her loyalty towards her parents and, in the later stages, more responsibility for her mentally challenged brother. She despairs as she sees her mother sink further and further into dementia, only to see her rally on many occasions and then once again lose her grip on reality. The author struggles to cope, especially running her riding school on her own while her husband is overseas, and sadly she is forced to give it up. The only joy she finds is in her writing, and the awards she wins for her poetry are the only accolades she receives as she struggles to manage on her own with both her emotions and the day to day practicalities – losing one baby after another, plus her constant worry about her parents. She finds it hard to come to terms with the role reversal, parenting those who were once caring for her. This book is written beautifully, the words flow smoothly, and even if the reader had not been told, the poetic influence shines through. Every word has its place in the narrative and I have no hesitation in awarding it five stars. A really, great read.